US: NYPD video shows man killed for aiming fake gun laser pointer at officers | Laser Pointer Safety - News of non-aviation incidents, arrests, etc. Police said Richards pointed the toy gun, with the laser pointer activated, at the officers. All four officers said they saw a red laser dot. To check this, LaserPointerSafety.com reviewed the videos, looking for indications of laser usage. You may want to follow along by looking at a short video clip with timestamps, that shows all four cameras’ views of events just before, during and after the fatal shots. At 18:00:58, the stun gun’s red sighting laser was in use. 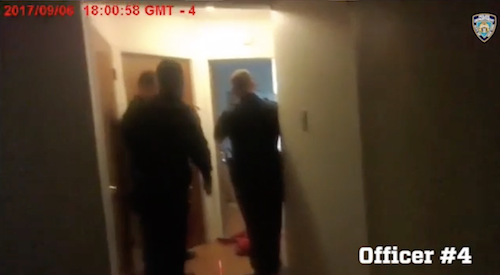 The first frame shows the stun gun (center) aimed down towards the floor, with a red trace on the floor. 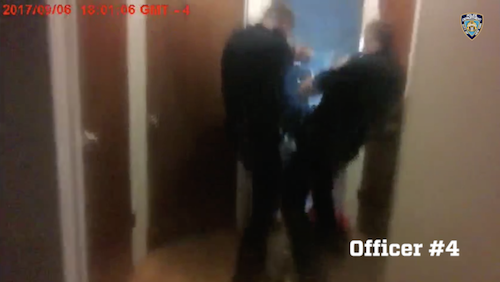 In the second and third frames, the red trace moves towards the door as the officer is simultaneously raising the stun gun towards Richards. 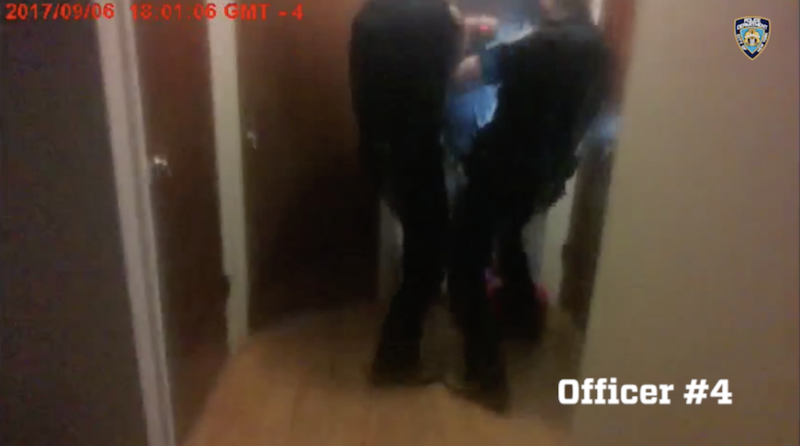 Here is the overall view of the scene at 18:01:01 from Officer #3, who has the stun gun, just before shots are fired. The next four photos show a close-up of the lower left corner of the scene. 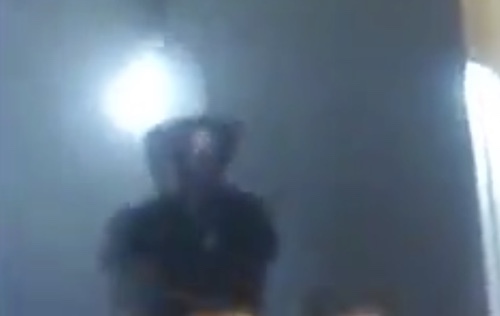 This is an enlargement of the full scene above. The stun gun is being lowered. Richards’ right arm (left side of photo) is down. Richards’ right arm comes up across his body, just above the bottom of the video frame. 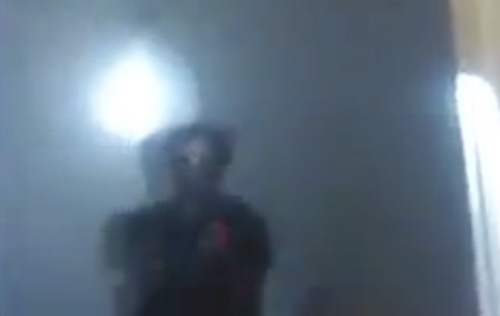 A red glow is seen from the end of his arm, undoubtedly his activation of the laser pointer on the imitation gun (since the stun gun is still lowered out of frame). Officer #3 quickly raises the stun gun. At about the same time, the officer on the right suddenly leans back as if he is startled or is avoiding something (e.g., Richards’ raised arm and laser pointer). From the brightness and from the location of the light in the opposite corner of the room, the laser dot would appear more likely to be from the stun gun pointed towards Richards, than from a laser pointed by Richards back towards the officers. That’s because the laser aimed by Richards, back towards the officers, might be on a surface outside of the field of view of the camera. Only if it happened to hit the officer’s outstretched arm, or the camera lens, would we easily view a bright dot from Richards’ laser. Another clue is that the laser dot moves from Richards’ location down to the floor, as if Officer #3 is lowering his stun gun. At 18:01:06, a red line can be very briefly seen on what appears to be the left officer’s (Officer #1’s) right upper forearm. This is the same time that the officer on the right quickly leans backwards, as if avoiding something. 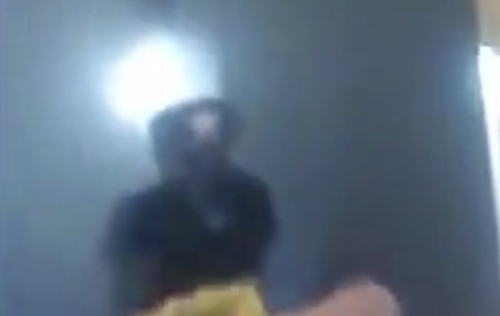 Assuming this is a laser, it would most likely be from Richards, deep inside the room, rather than from Officer #2 with the stun gun who just a second earlier had entered the room with his back to the two officers shown here. From the sounds on the video, one shot — the stun gun? — was fired before the frame below, and then numerous shots were fired afterwards. 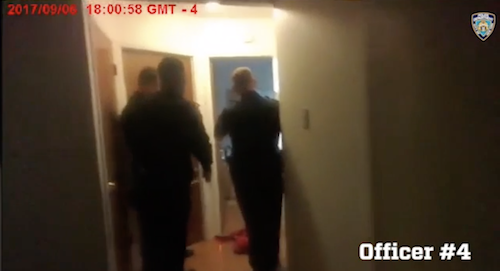 Hypothetically, Richards could have been aiming towards the officers at the door, hitting the one on the left, and causing the officers to return fire. Also under NYC Administrative Code §10-131(g), toy guns in New York City cannot have an attached laser pointer. 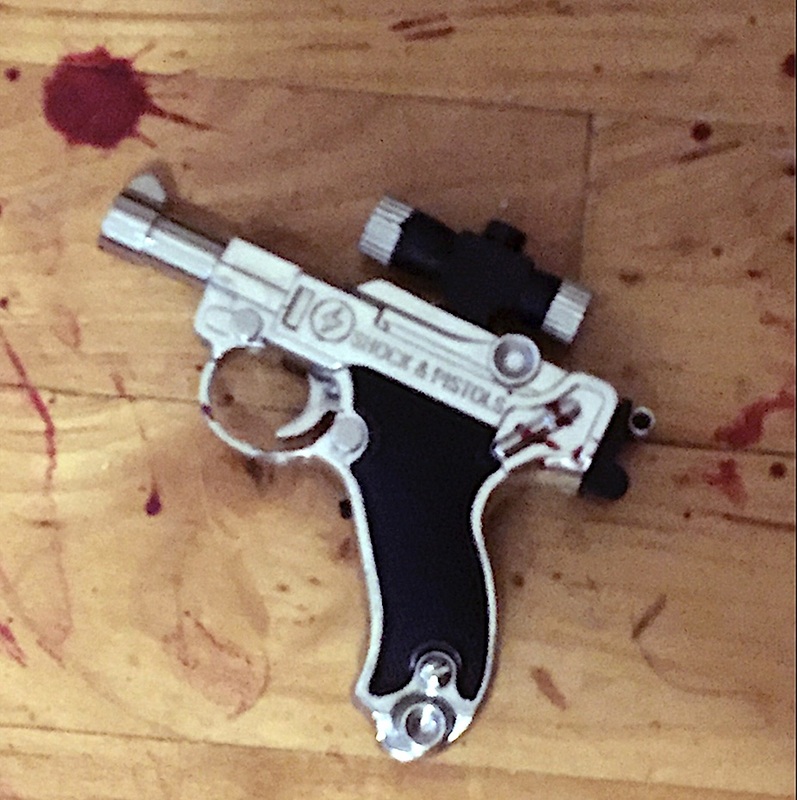 LaserPointerSafety.com has searched many thousands of photos at eBay, Amazon, Google Images, and Alibaba, but cannot find a toy gun that looks like this “Shock & Pistols” Luger-style pistol. Original September 6 2017 story from the New York Daily News. 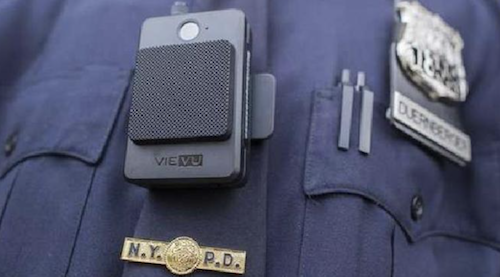 September 14 stories about release of the body-worn camera footage from WNYC News and Newsday. The NYPD released an edited video showing footage from the officers’ body cams; it is available on YouTube. 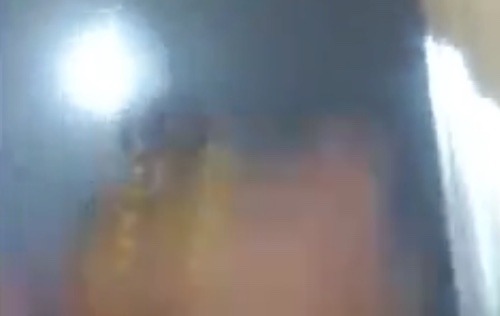 Additional videos from the NYPD body cams are here. A compilation all four body cams simultaneously synchronized, during the last few seconds of the incident, is here.